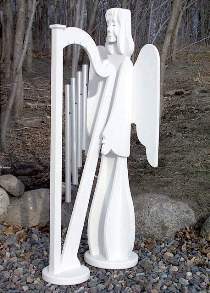 This graceful garden angel stands 50"H. When the wind blows you will hear the gentle music from the wind chime tubes which hang from her harp. All patterns drawn FULL SIZE. Order wind chime hardware parts separately or SAVE with the Special offer which includes the plan and #1551 Hardware.